Subcellular localization of Pfark-1–GFP. Live images of schizont stage P. falciparum transgenic parasites expressing the Pfark-1–GFP protein. A. Parasites stained with Hoechst 33258. The localization of C-terminally GFP-tagged Pfark-1 protein (green signal) was observed as paired dots in close proximity to Hoechst-stained nuclear DNA (blue). B. Parasites stained with Hoechst 33258 and ER-tracker. The ER forms a highly developed membranous system from trophozoite to schizont stage. 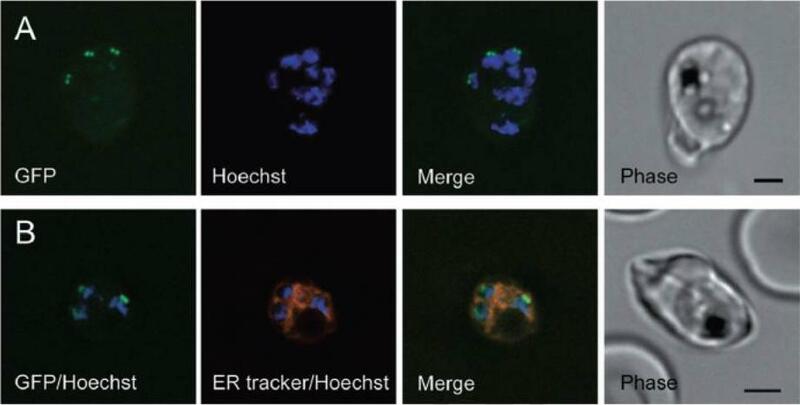 The superimposed images show that the GFP-tagged Pfark-1 protein (green dots) localize to the edge of the nuclear DNA (blue) and the ER/nuclear membrane (red), suggesting a localization of Pfark-1–GFP in contact with the nuclear envelope.Reininger L, Wilkes JM, Bourgade H, Miranda-Saavedra D, Doerig C. An essential Aurora-related kinase transiently associates with spindle pole bodies during Plasmodium falciparum erythrocytic schizogony. Mol Microbiol. 2011 79(1):205-21. Colocalization experiments of Pfark-1–GFP with a-tubulin. Fluorescence microscopy of fixed schizont stage transgenic parasites expressing Pfark-1–GFP. A and B. An anti-a-tubulin mAb recognizes discrete foci (red) near DAPI-stained nuclear DNA (blue). The red fluorescent pattern is consistent with early-stage mitotic spindle formation developing from the spindle pole bodies anchored in the nuclear membrane. 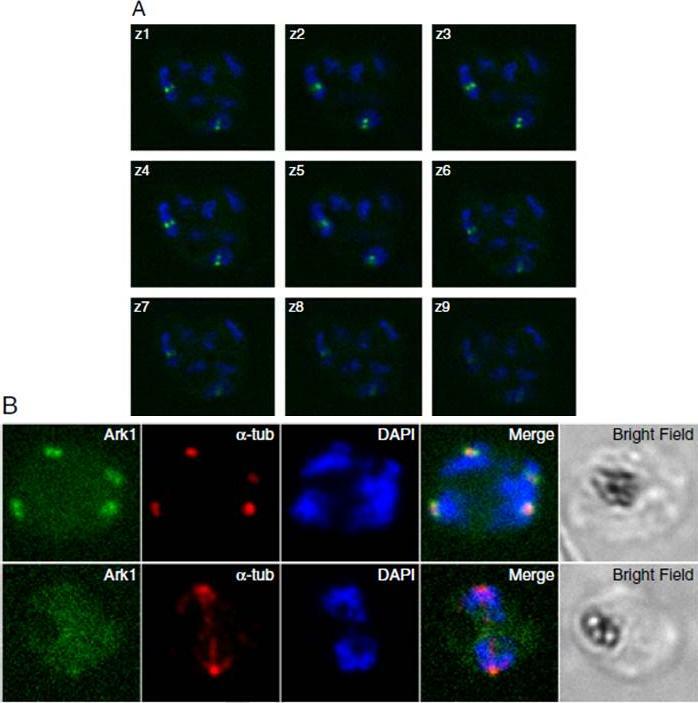 In colour merge images, the Pfark-1–GFP protein appears to localize at opposite sides of the early mitotic spindle, consistent with a localization at the mitotic spindle poles. 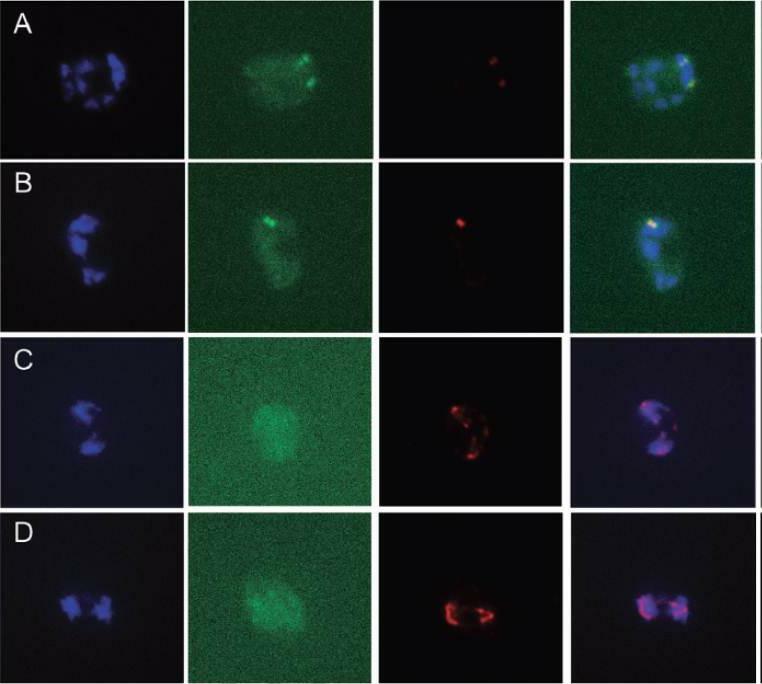 C and D. In these two panels the anti-a-tubulin mAb recognizes partly disassembled bipolar mitotic spindles (red) aligned with DAPI-stained nuclear bodies (blue), representing daughter nuclear bodies in the process of completion of nuclear division. The Pfark-1–GFP protein does not appear now to be confined to mitotic spindle poles. A diffuse cytosolic green fluorescence is observable, presumably representing the GFP degradation product observed by Western blot analysis.Reininger L, Wilkes JM, Bourgade H, Miranda-Saavedra D, Doerig C. An essential Aurora-related kinase transiently associates with spindle pole bodies during Plasmodium falciparum erythrocytic schizogony. Mol Microbiol. 2011 79(1):205-21.